Saturn's Moon Hyperion (Fig.1) has a very unique appearance, especially regarding its craters. 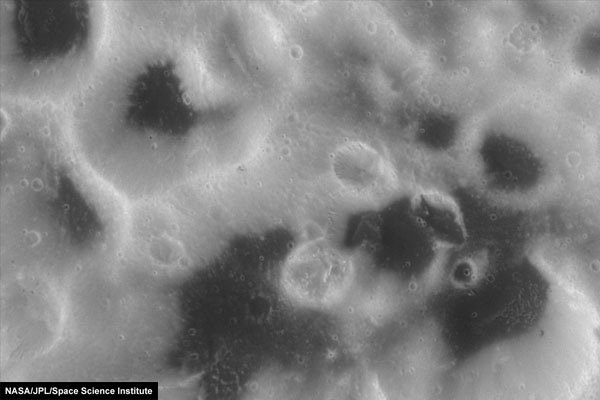 The material that shows up at the bottom of many craters is very dark, while most crater rims are brighter (Fig.2). with its origin being either from space (other Saturnian moons) or melting/sublimating dirty ice on Hyperions surface. The dark dust would slide down the crater walls and accumulate on the bottom of the craters. - There are many (small) craters visible not only in the bright material of Hyperion, but also in the dark component. Examining the many closeup images I could not find a single crater in the dark material that would expose bright material beneath. If the dark component would indeed be a more or less thin layer deposited on the crater bottoms one should find many small craters were this thin layer was blasted away by the impact. At least the center of a crater exposes material from beneath, so the center of the small craters would have to be bright if the dark stuff was just a thin layer. - On the other hand one could assume that nearly all craters are older than the dark layer, but then we have to explain why there are so many craters without any trace of the black stuff. - There are nearly no traces of the dark stuff at the upper portions of the crater walls as well as on other level areas on Hyperions surface that are not crater bottoms, and in particular the typical traces of material sliding down a crater wall as one could see them on Phoebe for instance are missing. Because of these discrepancies of what I believe to see with the official explanation for Hyperion's dark crater bottoms I developed an alternative model for Hyperion (Figure 3). Please note that this model is not based on any official statement, so it should not been taken as an official explanation of what we see on Hyperion. This is solely my personal attempt of an explanation of the processes that may alter Hyperion's surface. 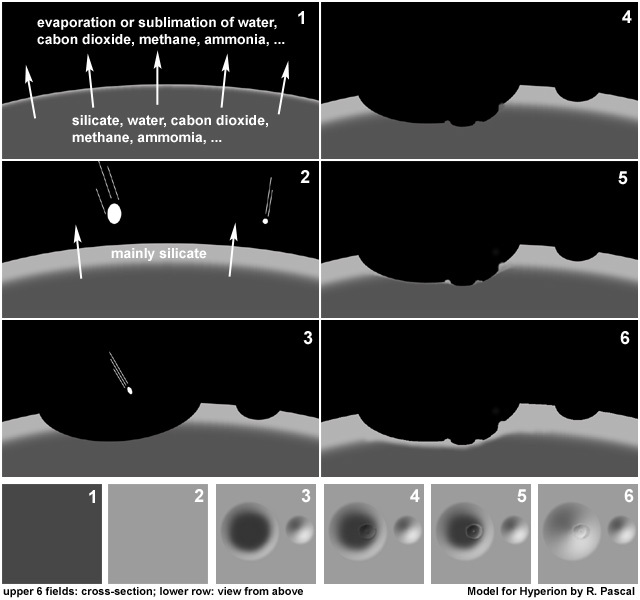 Fig.3: Model for the processes altering Hyperion's surface, and resulting in the dark crater floors. - The arrows that symbolize evaporation or sublimation are only drawn in Figs.3.1 and 3.2, in the following Figures they are left away. The original material of Hyperion is a porous, dark mixture of silicates (from dust to rocks), frozen water, and all the other components that are typical for a relatively primordial body of the solar system like carbon dioxide, methane, ammonia and other. Due to warming by the sun, perhaps supported my micrometeorite bombardment or by internal heating resulting from Saturn's gravitational influence, the water and the other volatile components slowly evaporate or sublimate. 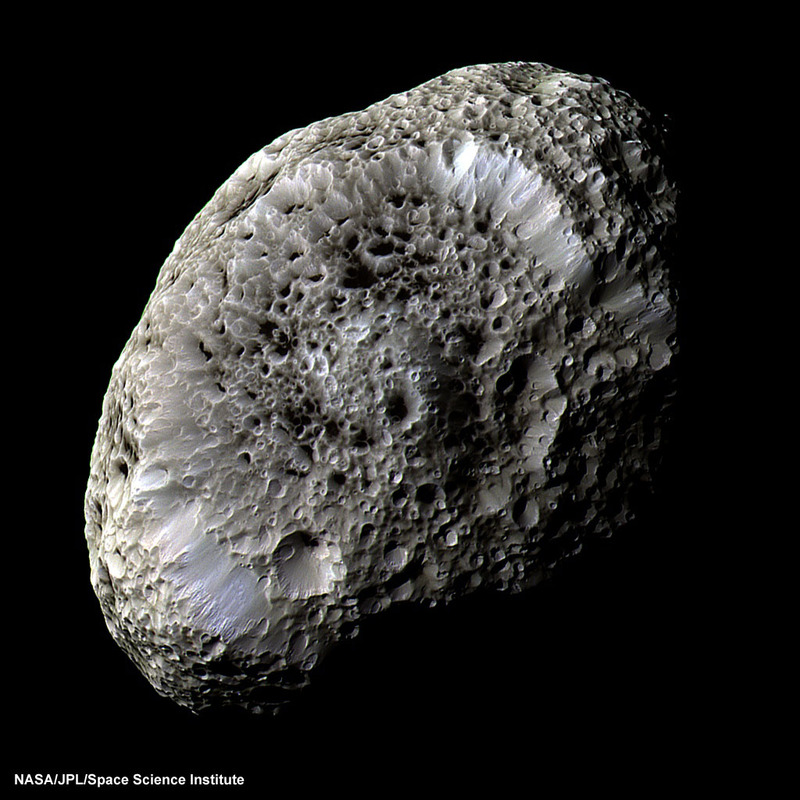 This process leaves behind a brighter layer of silicate-rich dust and rocks that covers the surface of Hyperion. The evaporation rate slightly decreases with growing layer thickness, but it does not stop, since the porosity of the layer still allows the volatile components to reach the surface. The timescale for this process is at least some million years. If a meteor crater is deep enough to reach down into the native material, we see this appearance that is typical for Hyperion, with the dark, water-rich material from below exposed at its bottom. The crater floor will slowly develop a bright surface again, since the evaporation or sublimation should be increased if the layer of silicate dust is missing. On the other hand, the evaporation or sublimation rate may be reduced at the crater floor due to the originally porous material being compacted by the pressure and heat of the impact. ...the increased surface to volume ratio of protruding structures like the rim or the central hill speed up the loss of water. These structures become bright much faster than the surrounding terrain. After a sufficient time the complete crater is bright again. The thickness of the bright layer for a long time remains thinner than at the older surface. This may be the reason, why in this large impact basin more and smaller craters seem to have a dark floor than elsewhere.